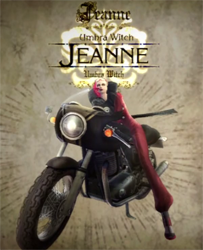 Bayonetta, unable to hide her worries about Cereza, finds her path blocked by another witch - Jeanne. Within her eyes lies not worry for the young child, but only blind ambition. She bats nary an eyelash at the statues revealing their connection, standing coldly in Bayonetta's path. "Fill your eyes with hatred. Accept your violent fate; accept it and earn the Left Eye! Prove you deserve it!" Unfittingly for a city of its small size, Vigrid plays host to a large military air base. 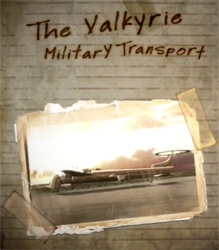 The roar of takeoff and landings that engulf the city are not that of passenger planes, but of incredibly large military transport jets known as Valkyries. I have been aboard American military transports many times in an official capacity, and have seen many of the finest jets up close; however, none compares to even a distant view of a Valkyrie. The size difference is clearly evident, like the difference in size between a crow and an eagle. To think that something that large could fly in the sky is something that I still cannot believe, despite having seen it with my own eyes. Of course, there is no doubt that the cargo it carries is quite dangerous, so seeing the plane's huge mass literally drop onto the runway during landings causes me to feel a deep anxiety, as if the weight of the plan were literally landing on my shoulders. It leads one to wonder what the authorities are bringing into this little principality, with all the extreme security they have in place. Vigrid has long since cut most ties with the outside world, and has reared itself within its own unique culture. At the centre of the man-made island of Isla del Sol, there is a display of sheer military force unimaginable for the likes of Vigrid. A display whose menacing power even I cannot shake. While there is very little public face to these efforts, if my information is correct, the military spending here rivals that of even the great powers in the world. Moreover, amongst the towers of enterprise and government, other buildings stand as anti-aircraft counter-measures. 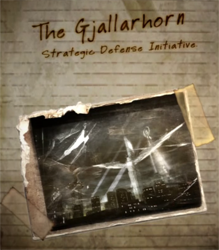 These buildings, a strategic defence initiative known as the Gjallarhorns, are equipped with a battery of anti-aircraft SAM missiles and have been placed in four corners of the island. What in the world would cause a small place like this to install such dramatic defences? There is also word that the Americans are involved in the armament and expansion of the military complex here. It is said that the Ithavoll Group is undertaking some sort of next-generation energy research, and thus has traded rights to this technology for added force of arms. It is not a wholly unbelievable story. Seeing all of the military takeoffs and landings here in Vigrid, I don't want to think their destination is actually the place I call home. Several hundred years ago, the now vanished clans of the Umbra Witches and Lumen Sages stood as the overseers of time immemorial, thriving from their remote European base known as Vigrid. However, their reign quickly came to an close via a violent war that ended in their mutual destruction. Their war, lasting for 100 years, saw the Witches and their campaign of assassination push them to the brink of victory; yet, the people's fear of these powerful women spawned the witch hunts, and eventually both clans vanished into the ether. Long serving the powers that be, it is said the clans did not use their power to interfere with history, but rather to protect its passage. We are told that they carried out these duties via use of their treasured "Eyes of the World". Yet, what this statement means is anyone's guess. What is clear is that the clans' very existence was closely linked to historical change, so much so that even kings and emperors feared the clans' power. There were two "Eyes of the World," one each controlled by the witches and the sages, which when used together were able to carry out their stated task of overseeing. To prevent the power of these "Eyes" from being used for nefarious purposes, they were equally split, and the clans prohibited inter-relations in an effort to maintain the balance of power that existed between them. The irony is that the grand war that led to the clans' destruction was sparked by these very treasures. After their downfall, the "Eyes of the World" suddenly disappeared. Information about them is extremely limited... What sort of item were the Eyes? What shape did they take? All this remains unknown. 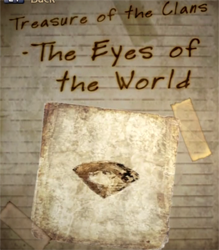 The black markets recently saw a large gem stone come onto the market bearing the name of the "Eyes of the World"; although, it may be a different item under the same name, or even a Mafia scam meant to gauge market reaction. There is no proof that the ancient treasure was actually a gem, but there is reliable, albeit troubling, information regarding the treasure and the CEO of the Ithavoll Group. It is said that he is in search of some unknown item for his development project in next-generation energy, but whether it has any relation to this matter requires further research.